Max. 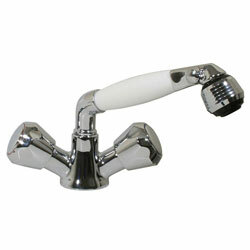 Height: 4-1/2", Hose: 5' White Nylon, Cutout: 1-1/2" dia. Scandvik 46011 Combination Pull-Out Sprayer with Adjustable Aerator is perfect for compact heads as they act as a basin faucet and a shower in one! Also see Scandvik bulkhead shower handle holder (model 10006) or shower rail for elbow handles (model 10650) both Sold Separately. Hose: 6' White Nylon, Cutout: (2) ea. 2-3/4" dia.